When i first started my degree course i think i suffered with severe tunnel vision as to what ‘Art’ was all about. If it wasn’t hanging in a gallery, lit professionally, and displaying great skill and mastery of what i considered to be artistic ability then i didn’t really class it as art at all! On the 13th of February i watched a documentary of Sky 1 Arts channel about Anthony Gormley and the fourth plinth project. I had researched him a little on a previous project, and was impressed with some of his amazing creations such as ‘Angel of the north’ in Gateshead, and also the bronze cast bodies on crosby beach, and so felt drawn to watch the programme to learn more about this artist and sculptor. Ten years after creating the Angel of the North Gormley started to look at working on a project relating to the fourth plinth in Trafalgar Square in London. This plinth was originally meant to be an equestrian monument, but the funds were not available, and so 100 years later it was used to display contemporary art. Gormley decided that the plinth could be used for so much more than this! 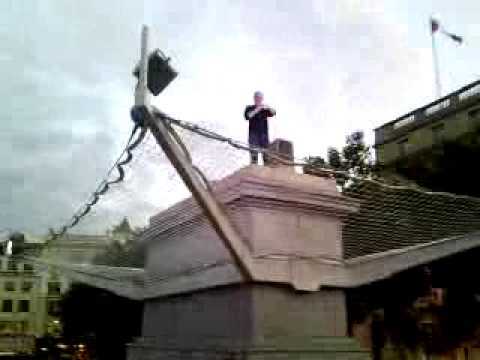 His idea was for one person at a time to stand on the plinth for an hour,doing whatever they wanted to do within that hour that demonstrated something about them. It was planned that 2,400 people would climb up onto the plinth over a period of three and a half months.This must have been a very challenging task to organise! Gormleys challenge in his own words was ‘can we make it a portrait of the UK now, using Trafalgar square and this little plinth as the lens through which we see what the UK is like now?’ He teamed up with public art producers ‘Artichoke’ (who were responsible for presenting the mechanical spider in Liverpool in 2008). Gormley was determined that for a short period of time the monument should be returned to the people in the twentieth century so that they could have a chance to have their lives valued and recognised – i found this to be an interesting thought, and provoked in me the question, are we all not artists in our own way? Is it that just some of us choose to portray our artistic talents through the medium of paint and such like? Have we all not got something to say? Gormley himself seems to have always had a desire to leave behind a legacy of himself, shown through the many body casts he created where he used his own body to create the form.Cast in bronze, he would indeed leave an imprint of himself in lots of places for many years to come.I wonder if this is what we all secretly desire? To not feel our lives were in vain, but to feel that just for a moment we were important enough to be seen and listened to, and that someone somewhere may mention our name long after we have gone? This was the opportunity Gormley was offering to the people of the UK. Gormleys art is very challenging as with many of his pieces he asks us to become a part of his experience, and to do this often takes a lot of imagination. He hoped that the fourth plinth project would enable people to show others what they hoped for, what they feared, and what they truly love.There were no auditions for the 2400 places, people were chose randomly , the only requirement was that each part of the UK was represented, even Gormley himself had to join the postcode lottery to see if he could get a place. Gormley once asked why we found it so necessary to leave a trace outside of oursleves of the fact that we were her in the first place, his own personal quest started off with his own bronze body casts but now he wanted real bodies to be displayed instead of metallic images.His comments were “lets see what happens when a living body occupys the frame of art”. I found through watching this programme a couple of times i began to really appreciate the fact that art is for everyone, and in everyone – and that it is purely a way of expressing our inner selves, whether we are college or university trained, or that we just have something to say that will benefit the world in general .We don’t need the confines of a glass and frame, we don’t need the recognition of so called experts, art is around us and within us, and is a way of expressing who we really are!